I've been eyeing this costume for awhile. 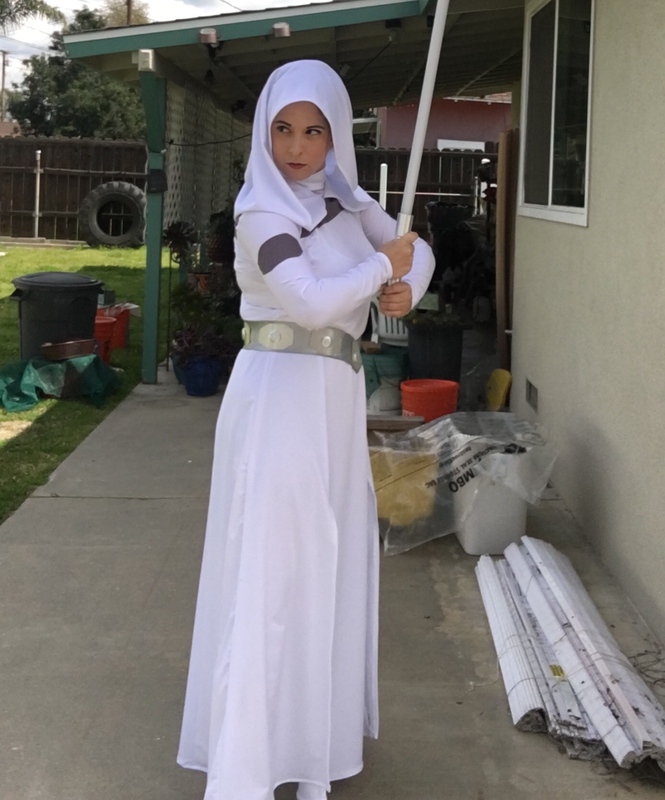 I love the idea of Leia as a Jedi but when it was first brought to my attention, I just didn't have the skill set needed to attempt the garment. I was itching for a new project as the rainy California weather has been keeping everyone indoors so I decided to revisit this outfit. The first thing I did was check out some of the reference images. 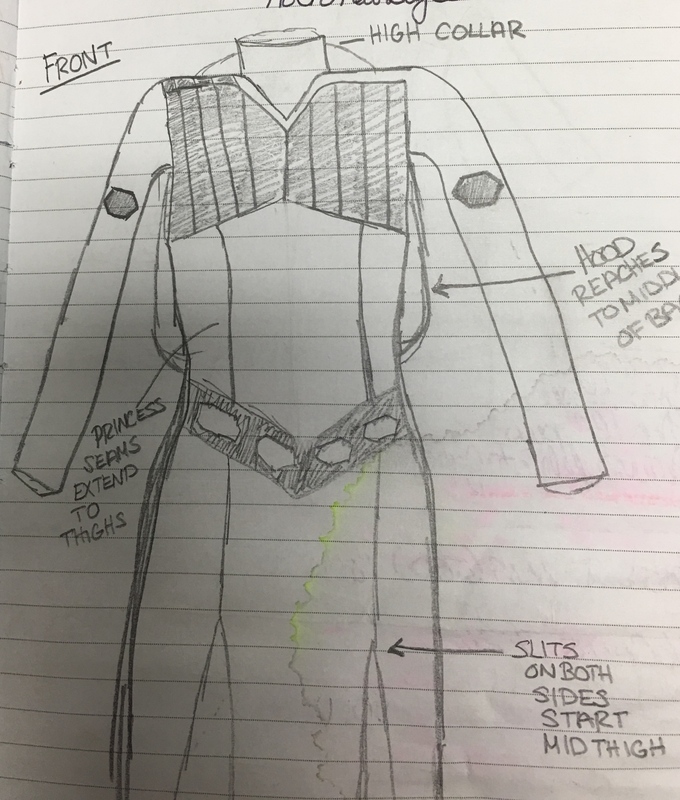 There were others from the comic available but I decided to start with these and sketch out what I "thought" the gown looked like. Please excuse my poor drawing attempts. I'm not the best artist. I also reference the standard as I was sketching to make sure what I was drawing matched what was needed. Once I felt I had all the pieces figured out, I went to JoAnn's in search of a possible pattern that I could modify. I lucked out tremendously with this find! 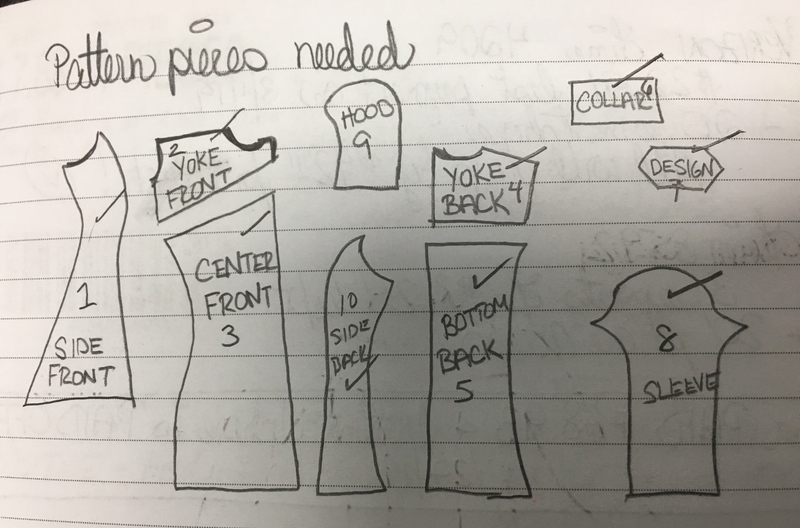 View B is almost exactly what is needed for this garment! The only big changes are the sleeves needing mods and the addition of the yoke and the hood. I kept seeing ladies referencing the Chu Crew tutorial for how they made their hoods so I checked it out and found the hood pattern to be easy to follow and exactly what I needed for this. Here is the basic pattern as shown in the Chu Crew tutorial but drawn out so I could reference it easily at home. I followed it almost exactly although I made the angle of the hood a little sharper than drawn. 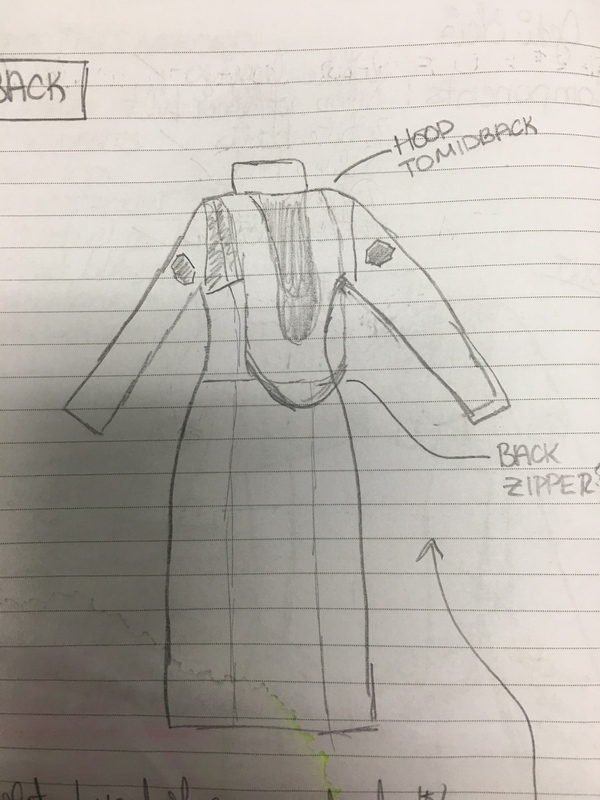 Originally I was going to make the yoke for the gown its own separate piece as shown in my initial sketch of the pattern. However, as I was speaking to Rebecca about it, she advised just adding the yoke on top of the gown instead. She had done that and hers looked lovely so I went that route instead. Using the upper portion of the pattern as a base, I made a separate pattern piece for the yokes for both front and back. Please note that my measurements are exact and do not include seam allowance. I added that afterwards. Once I had the yokes, I added the topstitching to them. Each segment is 1 inch in length. The dress assembly was easy. The main thing to remember is to leave the opening for the front slits. I forgot about them and had to seam rip them out to make them correctly. I adjusted the sleeve pattern so that it didn't flare out as much and also created a pattern for the octagonal shape on her arms. For that, I simply sketched out an octagon and then cut it out and added seam allowance to the pattern. Initially I used suede for both the yokes and the arm pieces but I thought about it and redid them in gray twill I had in my stash. Using this material made the gown machine washable and with it being white, I thought that wise. 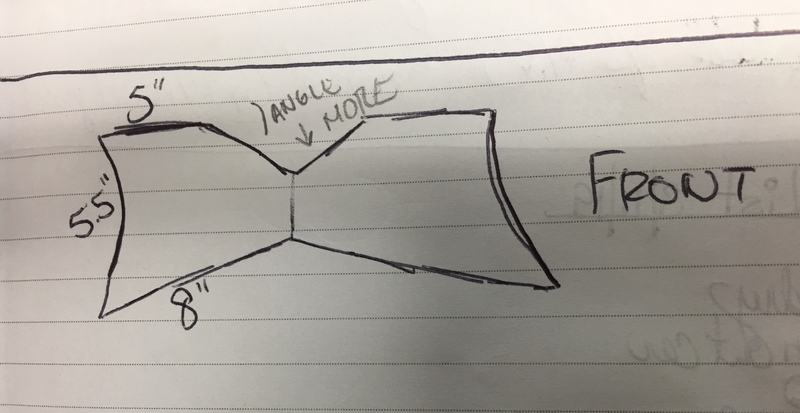 The collar I kept open in back instead of closing it as the pattern calls for. It closes with snaps that I stitched to the inside. Since the pattern is a pullover dress, I didn't add the zipper as I originally intended. Also, with the collar open, it was easier to pull the dress on and off. 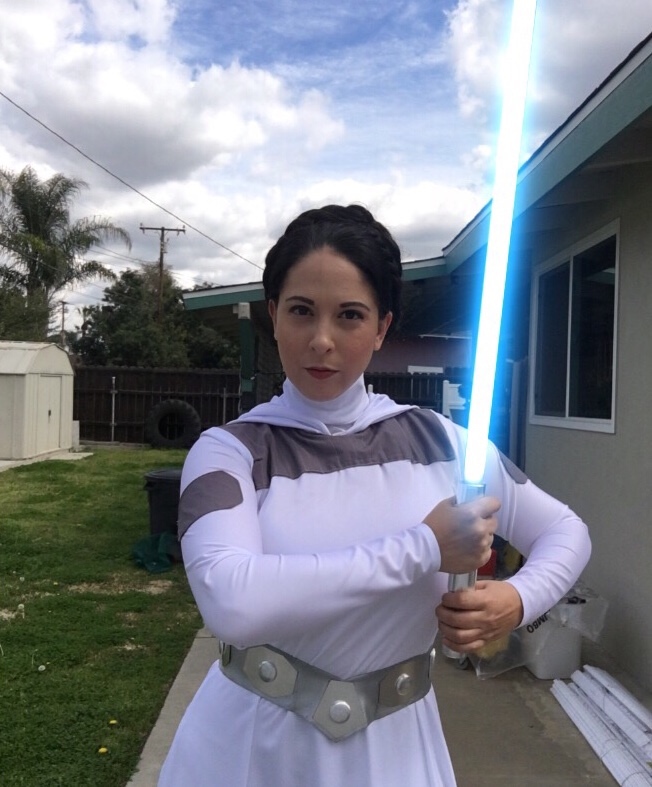 Once the dress itself was done, I added the hood. To find the correct placement, I centered the front portions of the hood and then let it drape naturally behind the gown. Once I had the proper placement, I pinned it to the front of the gown and then stitched it to the dress. After the hood was on, I pinned the yokes in place to go over the hood and then stitched it to the dress as well. There was a small bit of overlap but since I had left the sleeves to the last, I knew that they would be covered up. This is what the gown looked like with everything but the sleeves added. 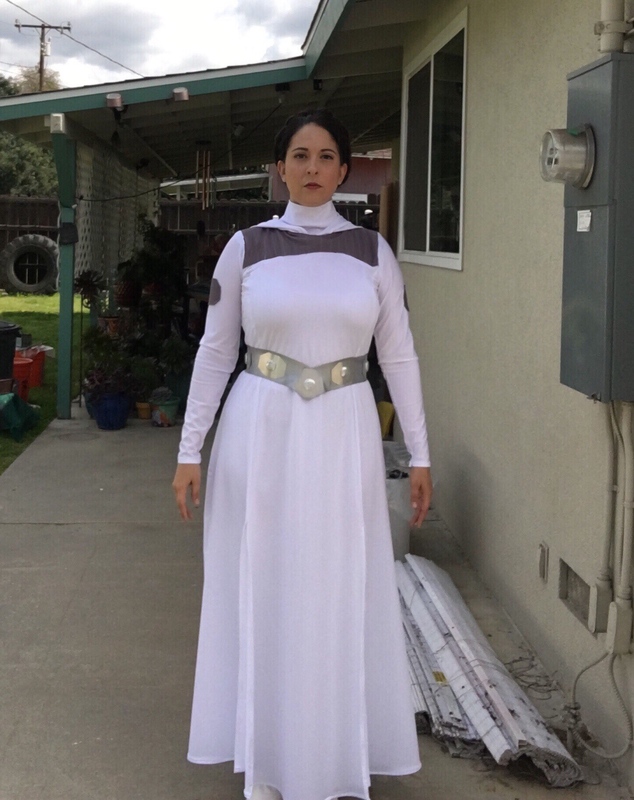 Sleeves were added and the dress was done and I was very happy with it. For reference, I found a great spandex knit at Hobby Lobby. It was a random find but at $12.99 a yard with a 40% off coupon, I couldn't resist. I bought 5.5 yards as I wasn't sure if I would need extra in case of errors but in the end, I used 4.75 yards total for everything including hood. I believe this is the fabric I used but as it's online I'm not positive. The price and description do match though! The pattern does run big so I suggest making a mock to get sizing right. 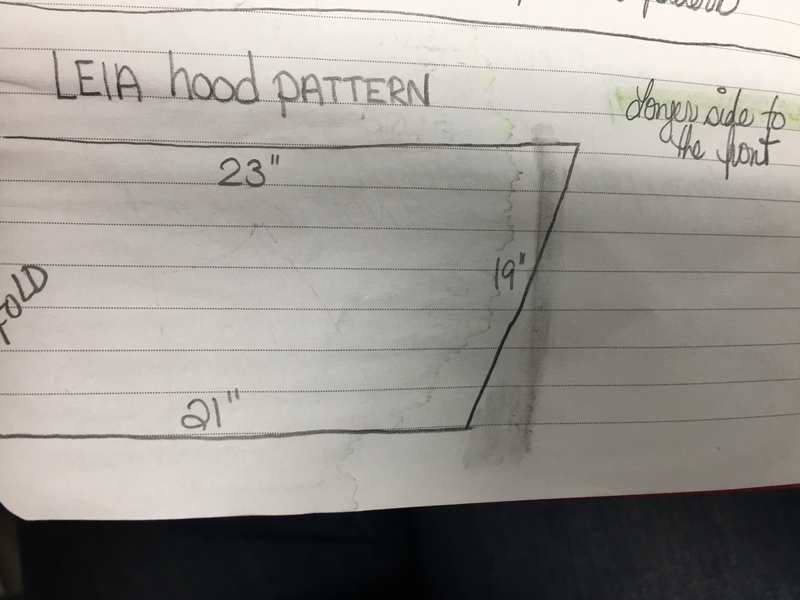 I was put at a size 18 due to my measurements but after making my mockup, I realized I was actually a 14 in this pattern. I really love the hood and couldn't resist taking a full shot with it up. 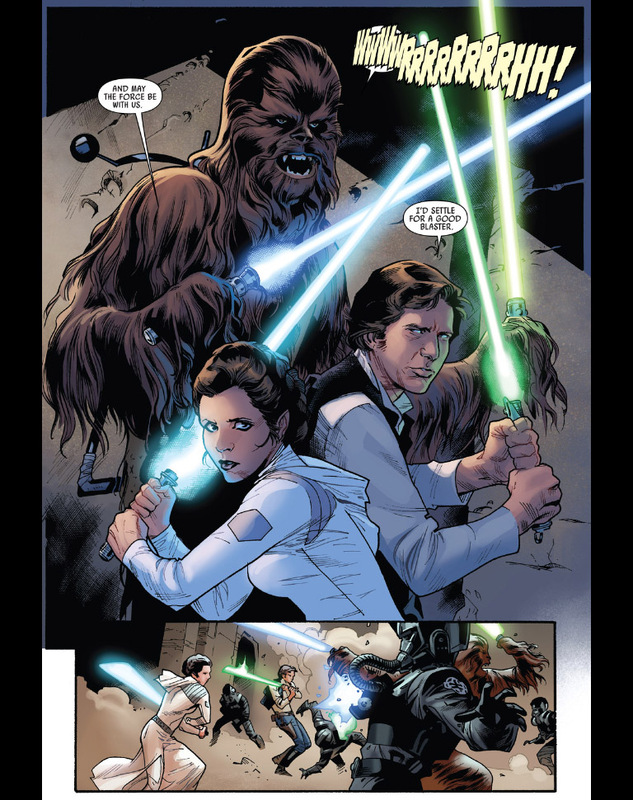 The standard calls for a silver hilted lightsaber. I ended up finding this one and got it as an empty hilt. Including shipping it was only $45. 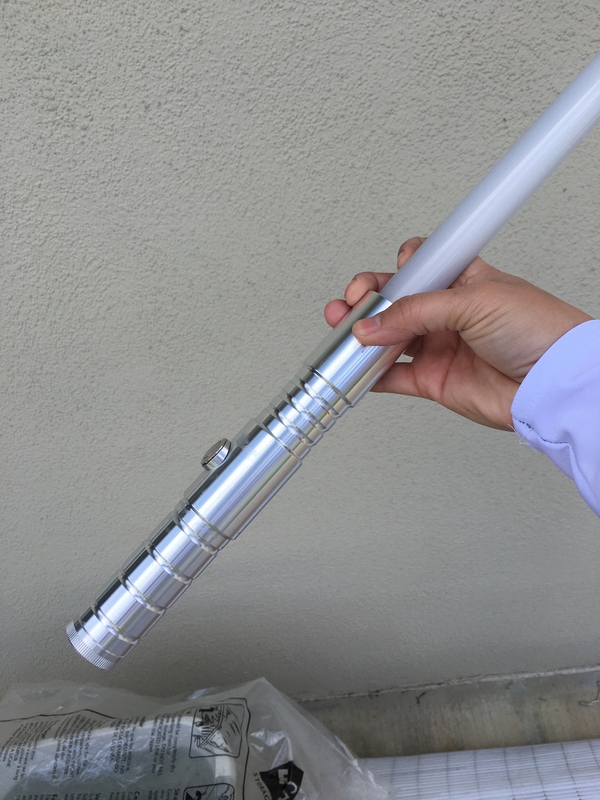 A fellow base mate helped me learn how to sauder the insides of the hilt so that it would light up. We used the Skywalker Blue LED and it lit up wonderfully after only a few hours work. Here is my finished saber. 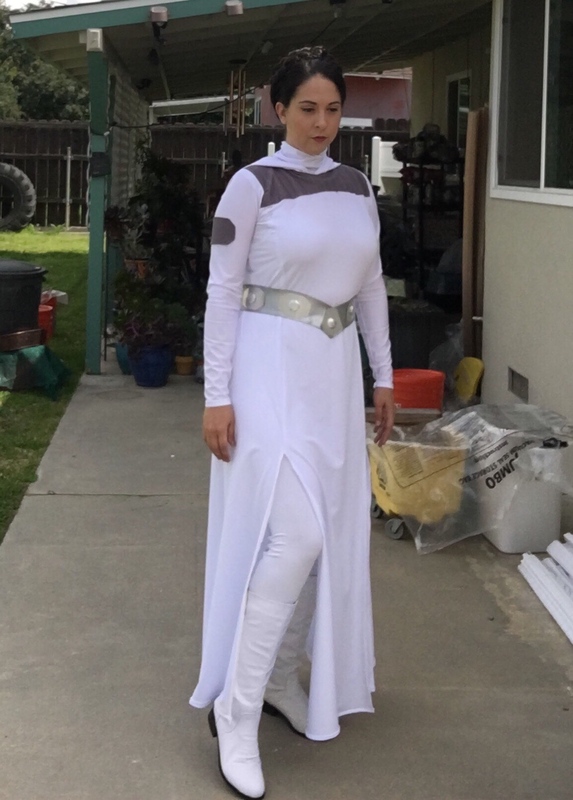 I already had the white boots from my Senatorial Leia and the silver belt from my Ceremonial Leia and white leggings in my normal clothing stash so I was set. Here is the finished look. Oh! For my hair, I used my own hair braided into a pre-braided piece of Kanekalon hair. 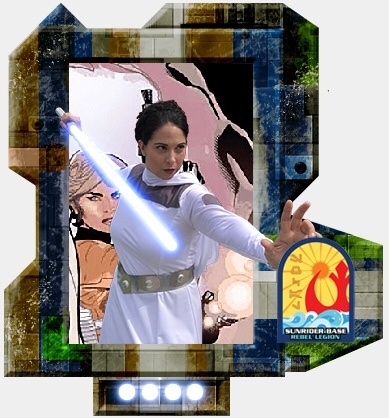 This is the same piece I used for my Hoth Leia and Bespin Leia. 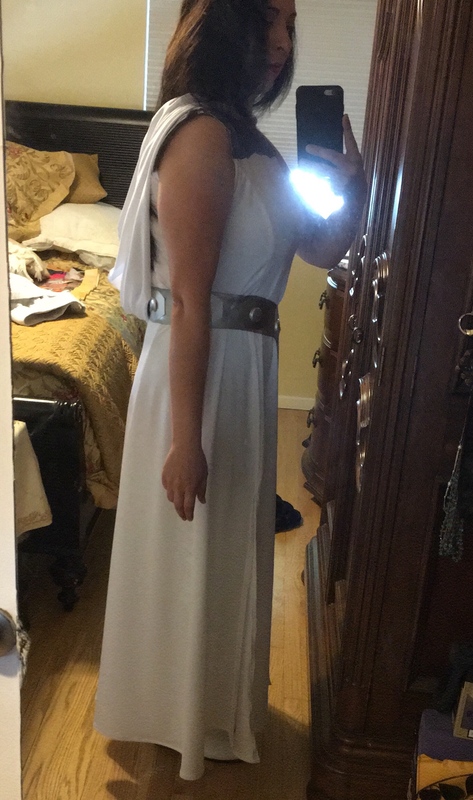 It's a super comfy costume and I cannot wait to wear it to events. 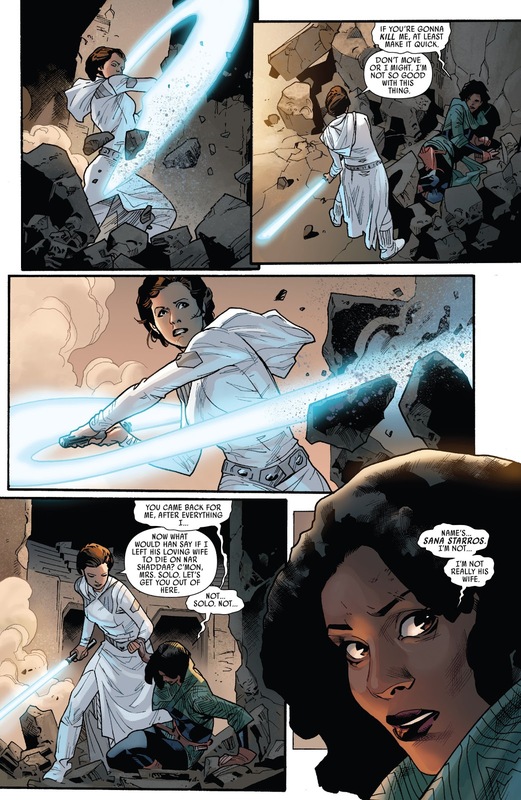 Yay for a Jedi Princess! Approved with no changes needed. Thank you! I love this look so much. It's a lot of fun. Thanks so much for the detailed how to!